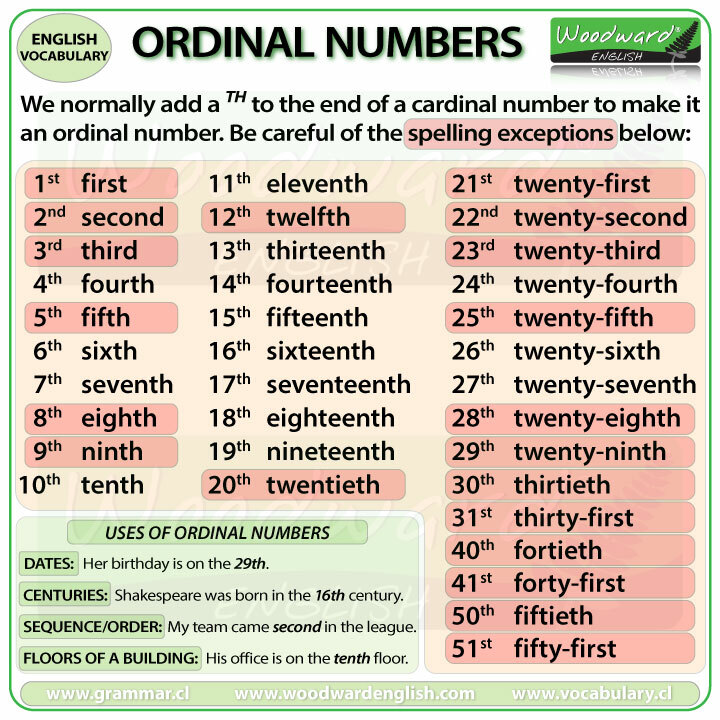 For dates in spoken English, we always use ordinal numbers, i.e. Fourth of July, not Four of July. However the ordinal numbers that are highlighted in red in the chart below are irregular or have a slight change in spelling. See our complete lesson about Ordinal Numbers in English. In spoken English we ALWAYS use ordinal numbers for dates. However in written English you may write a normal (cardinal) number without the -TH or -ST etc. after it. Even if it is not written, the ordinal number is still said in spoken English. In United States it is NOT common to put the -th after the number in written English. Day + Month: 25th December – used in the rest of the world. * The exception is with the name of the US celebration the Fourth of July. 2017 is divided into 20 and 17 so you would say twenty seventeen. ** For the exceptions, see our entire lesson about How to say the YEAR in English. Be careful when writing the dates using only numbers. 25 / 12 / 17 in the rest of the world (the day is first). There’s a big difference, isn’t there! To avoid confusion, when writing an email or any other written form of English, it is best to write the month as its name (January, February, etc.) or its abbreviation (Jan. Feb. etc.) and NOT as its number. And remember, the months are always written in Capital letters. In US English, a comma is put after the day if it is followed by a year. 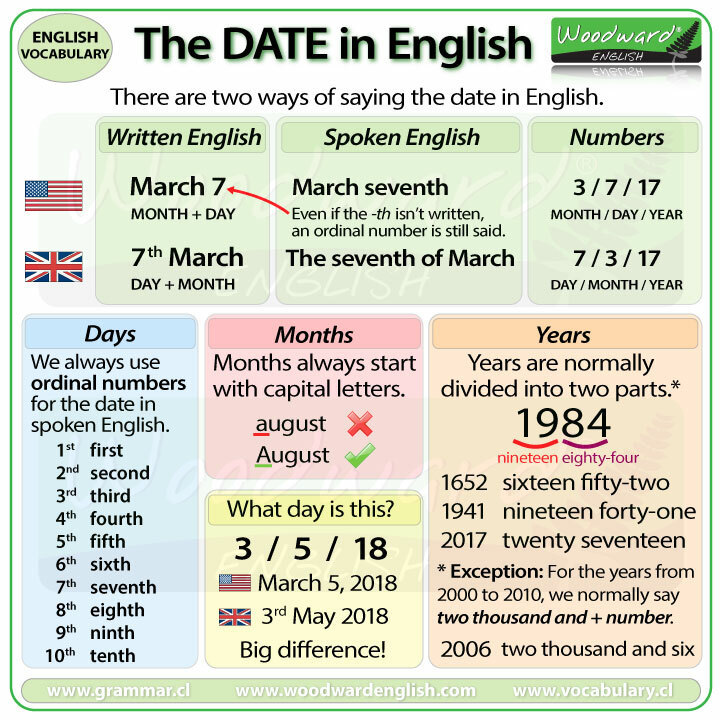 How can you ask for the date in English? – People will probably respond with a day of the week (It’s Monday) or the number (It’s the 19th). – People may give you the number (It’s the 19th) or the day/month (It’s 19th May or May 19th). They will not answer with a day of the week. What is the date (today)? OR What is today’s date? – This is another way where you will get a number as an answer.